Soak the beans in cold water overnight. In a large pot, combine the water, salt and beans. Bring to a boil, then reduce the heat and simmer until the beans are soft. 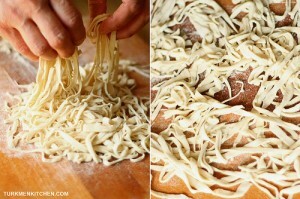 In a large bowl, combine the ingredients for the noodles and knead the mixture to a hard dough. Cover the bowl with a kitchen towel for 5 minutes. Sprinkle the dough with flour and roll it out to a thickness of 2 mm. Spread a generous amount of flour evenly over the flat dough. Pull up one side of the dough towards the center and fold back and forth into a zigzag. 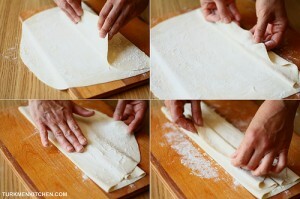 Sprinkle flour between each fold to prevent the layers from sticking. Repeat with the other side. Place one hand on the folded dough as a guide and using a sharp knife, cut into thin noodles. 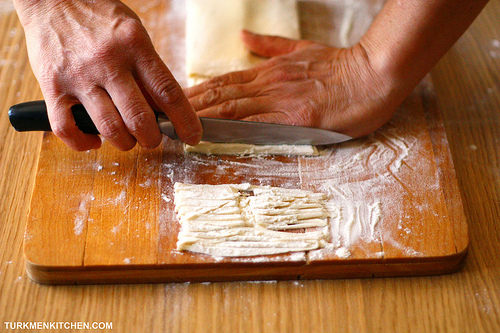 Pick up the noodles with your hands, gently shake off the excess flour and spread them out. Bring the water with the beans back to a boil, then add the red chile and noodles. Using a wooden spoon, slowly stir the noodles 3-4 times to keep them from clumping. Cook for 8 minutes. 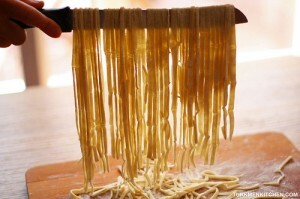 Remove the pot from the heat and stir the noodles to cool slightly. 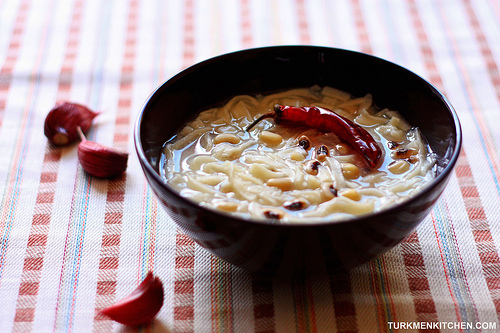 Gradually add the yogurt to the pot, stirring continuously to prevent curdling. Take out the red chile and mash it into the soup by pressing it against the side of the pot with a spoon. Grate the garlic into the soup. hachanda serkowladym, men su chorbasi kop iydim!